Early childhood nutrition lesson plans are a great opportunity to teach children about healthy living and taking care of our bodies. By instilling these values at an early age you can help develop children awareness to a healthy life style from the get go. 1. Healthy food is essential for healthy living. "You are what you eat." 2. There are three elements necessary for a healthy life style: Food, exercise, rest. 3. A balanced diet includes all food groups. 4. Food is the fuel of our body. 5. Different foods help different parts of our bodies. 1. What is healthy eating, healthy foods? 2. What three elements are needed for a healthy life style? 3. What are the four food groups and how do we have combinations of foods for each meal? 4. Why is food important? How do we feel when we are hungry? 5. Where does food come from? 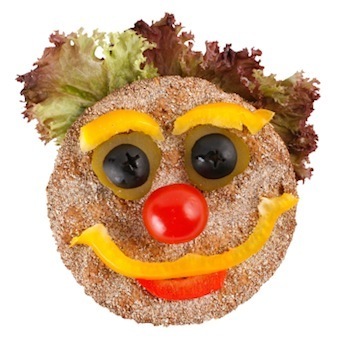 With the help of some bananas, raisins, tangerines and anything else your heart fancies you can create edible food faces. This activity helps develop children's creativity. Bring in flyers from your local grocery store. 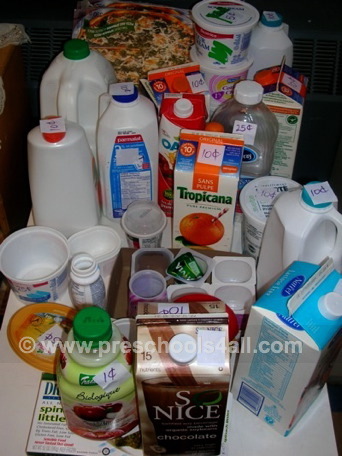 Let the children sort, cut out and glue the junk food in one group and the healthy food in the other group. This is a great fine motor activity as well as a pre-math activity. Which foods come from the ground and which ones from the tree? Have the children classify the foods according to their origins. This is a great pre-math activity. Check out this easy one stop shop for food stickers at discount prices. 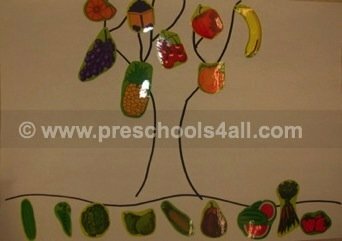 Each child draws their favorite fruit or vegetable. Attach all the pages and add this book to your class library. I would use a sentence template as follows: Child's name likes fruit or vegetable. The children will be able to 'read' this book independently. A simple and fun pre-reading activity. Have each child bring in a vegetable and prepare a class soup or a salad. By letting the children cut up the vegetable (with plastic knives) you are working on their fine-motor skills. Using manipulatives create food patterns. Orange-Banana-Orange-Banana. This is a great pre-math activity. Another fun activity is making placemats. 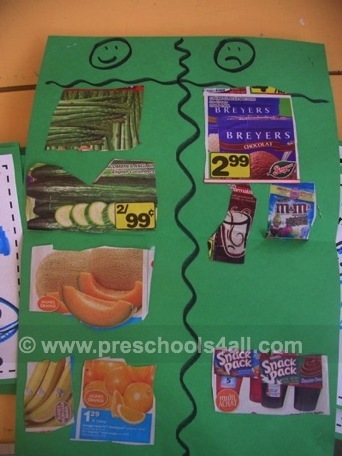 You can get the kids to draw, paint or print different foods on a large piece of paper. Laminate it and voila! You got a placemat! Cut up brocolli, tangarines, carrots and celery and let the children paint with them and experiment with printing.